Lease disputes can be a costly mistake for landlords. While it’s great to have a lease that protects your rights, what’s better is having a lease that helps you avoid a dispute in the first place. 1. The language in the lease should be easy to read. The most important job of the lease agreement is to encourage the tenant’s compliance. In order for a tenant to abide by the lease, the tenant must understand it. Standard lease forms are convenient, yet using an unedited version can create confusion. Tenants may choose to ignore terms or provisions they do not understand, and that spells trouble. The lease must appear relevant, or it will lose it’s punch. If you find that you don’t understand a provision in your lease, overcome the temptation to ignore it. Don’t assume that just because you don’t understand, someone else does. Likewise, overcome the temptation to delete the more obscure provisions, or instruct the tenant to ignore these. The better choice: consult with your attorney, find out what the provision means and whether you need to keep it, delete it, or modify it so it is more clear. Be familiar with your lease form before you share it with the tenant, so you will appear authoritative if the tenant has questions. 2. The lease agreement must prove a meeting of the minds. For a lease agreement to be valid, it must be clear — to a third party — that the tenant and the landlord have agreed to the same terms. Otherwise, there may be no way to enforce the promises. A standard lease form should be modified to the particular rental property, taking into account the landlord’s policies as well as the local landlord tenant laws. 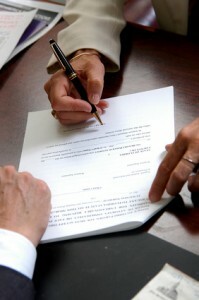 Every important provision must be included in the written lease agreement. If the landlord wants to enforce a non-smoking rule or regulate pets, these terms can be added to a standard lease. However, care must be taken to ensure that the additions to not conflict with other standard language that appears in the lease form. It is best to incorporate these changes into the body of the lease rather than trying to cross-out, write-over, or paste in language to the standard form. Otherwise, mistakes, like illegible entries, contradictions in terms, and missing pages are easy to make. It’s also crucial to prove that the tenant read and agreed to the terms of the lease. Provide a copy of the lease to the tenant in advance of signing, and make sure each adult occupant signs with his or her legal name. Another good idea: place the most important provisions at the front and in the body of the lease agreement if possible to stress the significance of those terms. In the event there is a legal dispute, that may aid with interpretation. More importantly, it will make the most crucial terms clear to the tenant and increase the likelihood of compliance, thereby preventing a dispute in the first place. 3. Subsequent modification of the landlord tenant relationship matters. Subsequent actions after the lease is signed, like accepting new occupants, releasing current tenants, returning security deposits, or changing amenities can have a major impact on the effectiveness of the lease, and may even terminate the landlord’s rights. This is one of the most common problems in a legal dispute. Unfortunately for some landlords, actions speak louder than words, and the changes cannot be undone. All pertinent terms should be included in the original writing, and if there is going to be a change, it should be reflected in writing as well. Be particularly wary of verbal promises made in person or over the phone, as well as emails and texts. Misunderstandings can give root to a legal dispute. It’s typically better to formally amend the lease than to make a verbal agreement that encourages the tenant to disregard any provisions found in the original lease. Also, be careful when making lease modifications for an individual tenant. This creates the risk of a human rights violation if another tenant is not afforded the same consideration. If a lease term must be modified routinely, it should be scrutinized and possibly removed or reworded.